Helen has been a member of the Face to Face collaborative project with 29 other artists between April 2018 and April 2019. Based at Artists Workhouse in Studley the project's inspiration was the history and stories associated with King Penda and the landscape of Mercia. A touring exhibition of the artworks and publication started at Artists Workhouse on April 5th 2019. Helen's work centred around two walks, the first was a short walk together with two other women, Deb Catesby and Jo Naden who set out to find the source of the River Stour. 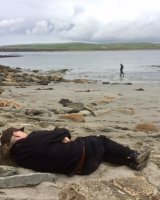 The second a longer adventure to the Isle of Rousay in Orkney with Adrian Garbett, Lynn Ceney and Kevin Ceney where we discovered the importance of Viking limpets!